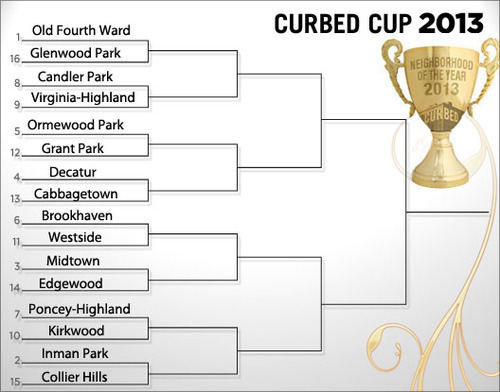 The Curbed Cup, our annual award for Atlanta’s Neighborhood Of The Year, pits unlikely bedfellows Brookhaven and Westside in a pillow-fight of pride today. This week we’ll feature two match-ups per day, and the full tourney bracket will be reviewed on Friday. Voting for each pairing ends 24 hours after it begins. For a recap on how seeds and neighborhoods were determined, see here. Now, let the eliminations begin! Making its Curbed Cup debut this year, the tony enclave of Brookhaven became its own city last year, and it prides itself on that sovereignty as much as its growing slate of attractions. Town Brookhaven is coming into its own as a post-Recession retail magnet, and Brookhaven Village is a tucked-away town center on Dresden Drive with killer calamari tacos. Ethnic dining options abound on Brookhaven’s eastern flank — a little thoroughfare called Buford Highway. Far more affordable than most of neighboring Buckhead, Brookhaven will still set homebuyers back a pretty penny, and some might knock the area as a tad too country-clubby. All together now … “West Siiiieeed!” This burgeoning ‘hood was runner-up in our inaugural Curbed Cup tournament in 2011, and its stock has only risen since then. Westside, a former main vein of Atlanta’s industrial core, is home to smart, adaptive reuses of historic buildings and new developments alike. Here you’ll find some of the best food, shopping and art hangouts to be had in Atlanta, especially with heralded restaurants like Bacchanalia and The Optimist. A stroll down Howell Mill proves the roster of dining options is set to expand soon, along with intriguing plans for the Westside Ironworks site and (hopefully) the Atlanta Waterworks plant. That brings us to the area’s chief drawback — lack of greenspace — followed by its remarkably sludgy traffic.